Plot - in the age of 2043, A Village was attacked by monsters and vampires, Vampires killing Defenceless Humans while the Monsters weaken them..A Group of Vampire hunters were in the job, but all of them were killed by Dracula himself..so its up to their Final Hope..A Young boy with Mystic Light Powers used to kill all the monsters in sight..Will he defend and succeed or will he Lose and die like the others. Read them Carefully, There in the Sub Forums.. If you understand this put. "Against Leon." or "Helping Leon." Bio: He is the new hope for vampire hunters...he may look weak but his skills think otherwise..he is the Heir to the Kenji Throne..He promises to make Vampires become normal again if they help him. If their against him however..expect a Limb to be sent back to your leader.. He is Highly Skilled in Heraldry magic and Death blades..
Human, Monster or Vampire? : half human half vampire. Leon was in his cloak, walking in a forest, it was raining. Kristen was sitting up in a tree, practicing her shooting at a distance, making sure she hit the target. She practiced curving the bullet too. Leon heard a gunshot. "!?" Kristen jumped out of the tree, and ran towards where the bullet hit. "DAMN." She said as she barely hit her target. Leon barely moved from the shot..it skimmed past his eye and kits the wall. Leon then looks up. "hmm..nice shot.."
Kristen ignored him, and let out a sigh. "I haven't practiced or even fought in a whole year, that is not good. That is the worst shot ever taken." Leon then just walks off. "hmph..well have fun.."
Leon. "hmph..whats it to you?" Leon pushes the gun off his forehead. Leon. 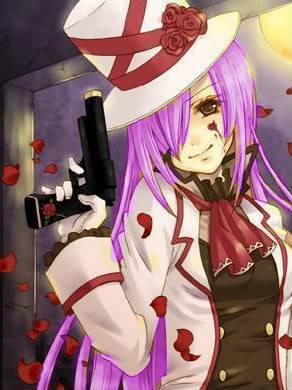 "...My name..is Leon..and why im here is a secret..."
She turned and went back to the tree with her target, and she ripped off the target. "Hold this." she threw it at him. Kristen shot at the target immediately. Except, she made the bullet curve around him and hit the tree behind him. Leon just stood there not even moving..with his serious face..
Kristen blew off the tip of the gun. "better." she smirked and turned to walk away. Leon. "Sorting out a little Bug problem..you should go home.."
"I am home." Kristen replied. "I don't have a certain home. The world is it." Leon sighed. "..alright then..have fun.."
Some vampires Screech, Smelling Blood.